By “internet speed” most people mean, “how fast I can download things” like web pages, music and movie files, software, etc. Internet service providers tune their connections so that most of their available bandwidth is devoted to downloading and far less to uploading (sending) things. ISPs do this because a) they know fast downloads are of greater importance to most consumers, and b) they want to discourage people from running high-traffic business Web sites from their consumer priced accounts. PC Pitstop offers a FREE Internet Speed Test. When uploading or downloading, the Internet is “bursty.” That means your file transfer will go very fast one instant and very slowly the next. “Net speed” is generally measured as an average, dividing the time it takes to transfer a file of a given size into the file size. If it takes 1 second to transfer a file of 1 MB, your Net speed is 1 MB/s – at that particular time, and between the two particular points. 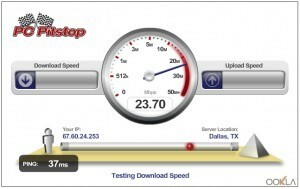 Bob Rankin download speed test, internet speed test, upload speed test. permalink. It does not work correctly in another country, I have 100Mpbs and it tets 5Mpbs London and 6 for LA, I am in Auistralia. Thx.